Q. Is the bedding supplied? A. Yes, all bedding, sheets duvets and covers, pillows and covers (all beds and pillows have protectors fitted), except for a cot, please bring your own. Q. Is a cot supplied? A. Each tent has a travel cot and high chair. Q. Is there a fridge freezer? A. Yes, a fridge 60L /freezer 25L. Q. How many can the tent sleep? A. Six; One double 5ft bed, two single beds and a 4ft 6 den bed, plus cot. A. Yes, bath towels and hand towels are provided. Plus tea towels. Q. Can I book direct? A. Yes, we accept BACS transfer of a 20% deposit, balance to be paid 6 weeks before arrival. No booking fee. A. Yes, holiday insurance is required and is a condition when booking, sometimes comes with your bank account. Q.Is there hot water and cold water? A. Yes, hot water is provided by an instant gas water heater situated outside the tent. Hot and cold water are mains water fed. Q. Are there products for washing up and cleaning surface supplied? A. Yes, washing up liquid, surface cleaner and hand wash products and cloths/ scourer are supplied. Q. Is there a Cafetiere? Q. Can you drink the water? A Yes, the water is ‘soft’ water and is lovely to drink. Q. is there a shower? A. Yes, there is a double shower and a washbasin inside the tent. Q. Is there a flush toilet? A. Yes, inside the tent, the three ‘P’s’ apply (One is Paper). Anything else will block the digester system, unpleasant and costly! Q. Is there a place to wash boots and dogs? A. Yes, an outside tap has a garden spray attached. Q. Do you have electricity in the tent? A. Yes, we have a toaster, kettle, fridge freezer and lights in the kitchen, bathroom and lounge area powered from two double sockets situated in the kitchen. 230 Volt 50 Hz supply with ELCB breaker limited to 1Kw. Q. Is there a microwave cooker. Q. Are candles permitted in the tent? A. Each tent has two lanterns which candles can be lit in. Candles are not permitted to be used outside the lanterns. There is a solar and wind up lantern in the bedroom area. Q. Can I use fan heaters? A. No the electricity supply is limited to 1Kw and will trip if too much current is drawn. We a have a smart meter that monitors the tents supply. Q. How is tent heated? A. The wood burning range cooker is rated at 11Kw, when set correctly. Instructions are provided. Q. How much is the wood for the wood burning range cooker? A. It is provided free; A basket of wood is provide in the tent, with a tub of wood under the tent. After this you are free to help yourselves from the woodshed adjacent to the honesty shop. Q. Can you cook on the range cooker? A. Yes, you can cook on the range cooker and bake in the oven, instructions are provided. A. Yes, a four ring gas stove is provided for use on the veranda. Not permitted inside the tent for gas safety reasons. Q.Is there a smoke alarm? A. Yes, there is a smoke alarm situated in the bedroom and a CO alarm sited near the kitchen. A fire extinguisher and fire blanket are also provided. All are inspected weekly. Q. Are the floors insulated? A. The floors of the tents are insulated to make it cosier on those chiller evenings and mornings. Q. Is there a stair gate? A. Yes, a permanent stair gate is provided. Q. Is there any external lighting? A. No there are no street lights or external light to the tents or field. Bring your own torches. Q. Are there gravel path ways to the tents? Q. Are there playing facilities? A. Yes, there is a large trampoline (with safety netting) and a climbing frame with swings. Children must be supervised. Q. Is there a BBQ. A. Yes, each tent is provide with a BBQ and BBQ utensils, bring you own charcoal. Q. Where are vehicle parked? A. Vehicles are parked near to the field entrance on a gravelled surface. Vehicles are not allowed near the tents, plus you will get stuck and charged for towing off. Q. Is there a fire pit? A. Yes, a fire pit is provided with rustic seating down near the river. A non- chrome grill is on the fire pit, lifted off by the chains. Use the chromed grill from the BBQs raised up on pieces of wood for best results. Q. Is the wood for the fire pit free? A. Yes, and is stored in a small area near to the trampoline. Please remember you are having a fire pit and not a bonfire. Charges maybe incurred if not adhered to! You can cut you own wood up with small wood saw provided in the tent. Q. Is the river fenced? A. Yes, access is at your own risk. We don’t own the stretch of the river near to the play area and fire pit, but do own the part nearer to the carpark. A. Each tent has seating on the veranda and a picnic table with integral seating. Additional picnic tables are provided around the field. Q. Is there an onsite shop? A. Yes, an honesty shop which stocks essentials, see list in the information book. Each tent has a key for the shop. Children must be accompanied. Q. Is there an area for dogs? A. Yes, toward the house and up the slope where the trees are is a dog doo bin. Please pick up after your dog. Sometimes we have foxes leave their droppings which are very smelly and dogs like to roll in. Q. Can I go anywhere in the field? A. Yes, but please be respectful of fellow glampers in the field and be aware of noise, remember you are in a tent! Please keep out of the orchard area at the top of the field with ‘Private’ on the gate. This is where we keep our bees. They have special skills, they will find you and they will sting you!!!! Q. Is a dog bed provided? A. No please bring you own. A. Up to a maximum of 3, depending on size, charged at £25 per dog per week and short stays. Please email for confirmation. Q. Is there a dog sitting service? A. 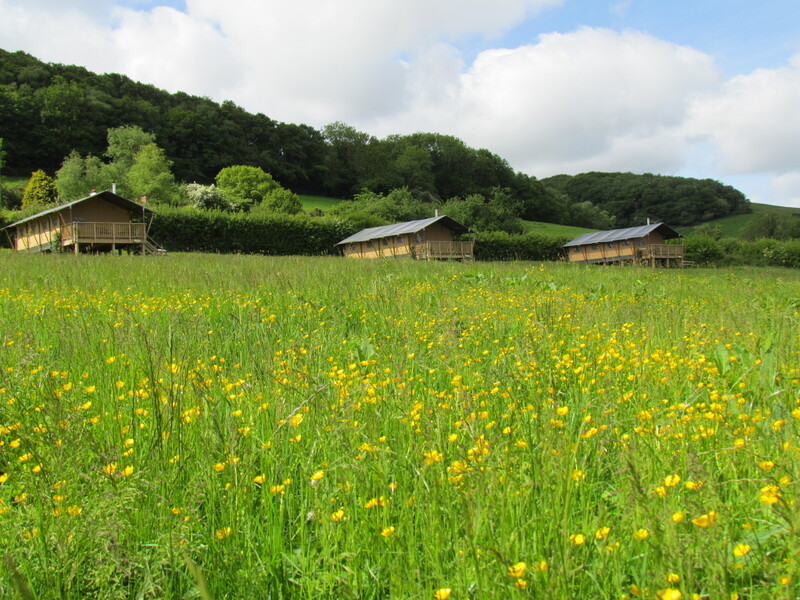 Yes, we can arrange a dog walking/carer service independent to Western Meadows Glamping. Please email for information.